The Federal Bureau of Investigation is asking the Libyan people for help in identifying three individuals who were on the grounds of the U.S. Special Mission in Benghazi when it was attacked on Sept. 11, 2012. The attack resulted in the death of Chris Stevens, the U.S. ambassador to Libya, and three other Americans. 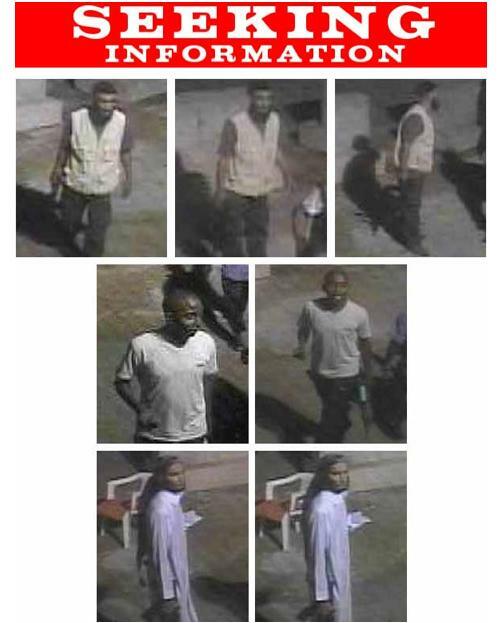 The FBI released surveillance photos of the men on Thursday, along with a bulletin that said it "appreciates that the Libyan people and the government of Libya have condemned" the attacks and is now looking for additional information related to the nighttime assault. The men are not explicitly listed as suspects by the FBI. "These individuals may be able to provide information to help in the investigation," the FBI said. The bureau urged anyone with information related to the attacks to text or email at BenghaziTips@ic.fbi.gov or to fill out a special form on the FBI website. The agency released the wanted posters in both English and Arabic. According to NBC News, the FBI to date has identified "45 persons suspected of involvement in the attack." It's unclear whether these men are among that group. The Benghazi attacks sparked a firestorm of political controversy in the United States because President Barack Obama's top aides initially linked it—wrongly—to anger in the Muslim world at an Internet video ridiculing Islam. Late last month, House Republicans released a report that implies then-Secretary of State Hillary Clinton misled lawmakers about her role in drawing down security assets in the war-torn country. The 43-page report also accuses Obama of failing to anticipate violence against Americans on the anniversary of the Sept. 11, 2001, terror attacks. The 43-page report also accused the Obama administration of trying to “cover up” the reality of the attack.